The Italian Concert Organ is a faithfully reproduced church organ with individual ranks and combinations, in addition to an exceptional sound engine able to restore harmonics, environment, mechanical noise and even more, in a completely customizable way. Works with FULL Kontakt v5.2.1 or newer (not on Kontakt Player). Old digitally-built combinations were recreated on the real organ and really resampled at 96kHz! INSTALLATION: open Kontakt. Just use the “Files” tab on the left to find the main Italian Concert Organ folder and click on it. Then double click on the mode you want to load. Recommended for all owners of single MIDI controller with a touchscreen. The controls are optimized for touch. Pressing and releasing the sustain pedal you can select sequentially the 16 patterns, while the Modulation controller switches to the other 16 patterns. In the middle is displayed the name of the pattern. Especially developed for all owners of single MIDI controllers that have a common monitor and scroll through the chosen patterns without taking hands off from the keyboard. With this mode, the user can store up to 8 patterns and call them by pressing and releasing the sustain pedal. Example: for my song I need sequentially the patterns 2, 5, 6 variated, 12, 15. For this purpose, I select the first (2). Once selected, I press S to store it in SLOT 1. Then I press the SLOT button and I see SLOT 2, then I’m going to choose the second pattern (5) and hit S to save it. Now we press SLOT button again to move to the SLOT 3 and memorize the third pattern (6 with V). And so on. Once done, you just press and release the sustain pedal to cycle through the stored patterns, in a continuous loop. You can store ONLY the pattern numbers and NOT the advanced settings like reverb. At the center is displayed the name of the selected pattern in the first red line, and the next pattern is in the second red line. The C button erases everything that has been stored. Developed to combine the patterns. It’s possible to combine up to 8 patterns, all on the same channel. It is as if the instrument was opened 8 times, each of which is customizable. 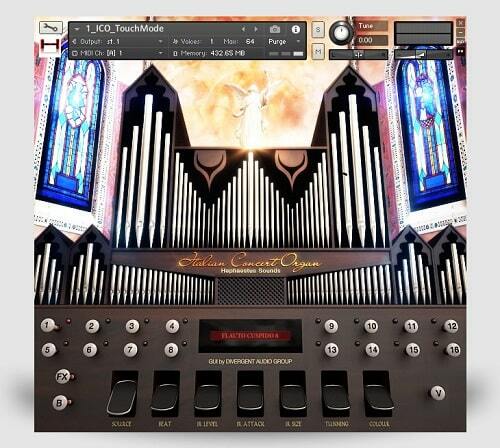 Developed for all owners of virtual organ console with no more than 3 keyboards and a pedal. It’s possible to combine up to 2 patterns with every controller. The keyboards have to be set on channels 1, 2, 3 and the pedal on channel 4. However, the channels are still editable from the Kontakt interface.